Today, cloud access security requires more than a simplistic secure VPN tunnel or single sign on from tightly controlled corporate applications. Users are demanding access to the cloud from a wider range of clients and directly on the cloud platform itself. From a compliance standpoint it is a growing nightmare involving orphaned accounts, infected clients, and un-auditable silos of user activity data left outside enterprise control. 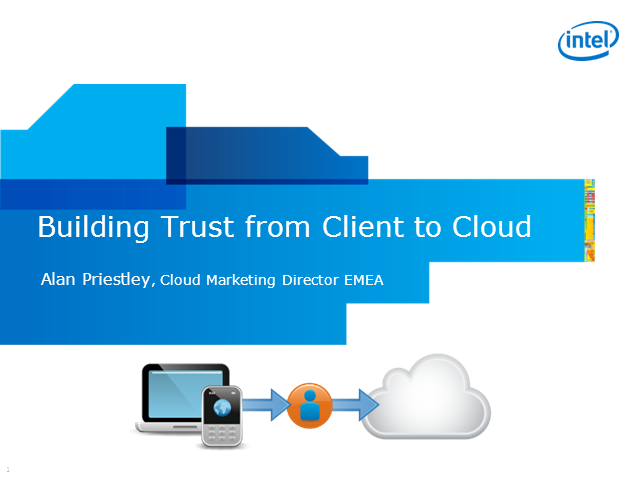 In this session, Intel showcases key technologies that are being used in the market today to build a trusted client to cloud connection. On the client side, Intel will present ‘Identity Protection Technology’ that will deliver strong second factor authentication using OTP one time password technology directly from the PC chip. To secure data in flight and access to the cloud, Intel expressway solutions enable federated single sign-on and web services security. On the server side, TXT trusted execution technology enables the setting up of trusted compute pools and establishing hardware root of trust between data centers. Attend this session to learn more about Intel’s 2015 vision for how to build a federated, automated, and client aware cloud. Jon Duren, Systems Engineering Manager, WWT, Inc.
As the adoption of virtualized clouds changes the landscape of our data centers, many organizations are beginning to take a fresh look at the way they approach networking. - Advanced Cloud Networking : Where is my Layer-2? Scott Miller, National Technical Solutions Architect, World Wide Technology, Inc. According to industry researchers nearly 75 percent of the organizations who have deployed a virtual desktop environment have stalled their deployment before completion leaving frustrated employees in departments ranging from IT, to the business units, to the executive suite. It isn’t a lack of good intentions causing these deployments to fail, but rather a lack of understanding of the holistic approach needed to successfully deploy a virtual desktop environment. Join WWT’s Dave Kinsman, National Technical Solutions Architect, as he discusses the 5 Pillars to VDI success. Join WWT's Dr. John Nguyen as he discusses the arcitectural best practices, sizing and deployment considerations for environments leveraging Citrix in their virtual desktop installations. Jim Kavanaugh, Don Seiler and Ladi Adefala talk about what it means to our customers that WWT is Cisco Master certified in Security and Unified Communications. Join Jason Campagna as he discusses various product and solution announcements made during the VMworld keynotes this week, and how WWT is working with VMware to provide a comprehensive software-defined datacenter approach with our Cloud-in-a-Box methodology. Jason is WWT’s Cloud Practice Director, working with a team of top tier solutions architects in the largest enterprise, service provider, and federal marketplaces. Jason has been a long term member of the Citrix and VMware Partner Technical Advisory Boards, and an author of several whitepapers for organizations such as VMware and Microsoft including the original Stateless VMware whitepaper design. At this year’s Geek Day, Cisco is sponsoring 6 technical labs: VXI, UCS, Security Gateway/Secure Mobility, Prime for Enterprise, WAAS and Cisco’s Intelligent Automation for Cloud (CIAC). Please come by to discuss these solutions with the Cisco team. There is a fundamental shift taking place in the way technology resources are delivered and supported. Virtualization and consolidation have forever changed the face of computing and server utilization by promising resource efficiency and reducing the hardware footprint. Meanwhile, technology-as-a-service and cloud based delivery models are emerging as the computing trend of the future, where users pay service providers only for exactly the amount of technology they use in a pay-as-you-go utility model, instead of buying and managing sprawling environments of software, hardware, and support services. 6fusion is an innovative Utility Metered Cloud company that has emerged in this new era of utility computing with a refreshing vision for the future, cutting-edge technologies and a unique commercial business model. Mobile devices and the risk posed by vulnerabilities in the software that runs them are proliferating. This talk scrutinizes challenges faced in securing mobile apps and contrasts them with legacy software security initiatives. We discuss how outsourcing confounds security efforts, how the mobile app lifecycle can make risk a hot potato, and a variety of other challenges organizations face as users demand ever increasing mobile capabilities. Which VMs are on a host server with compromised physical health? Where should I move a VM, or add a new one? What is the best "healthy" host server? How do I find this place? How do my VMs migrate? When a physical event occurs, who/what will move the VMs? Is this an automated or a manual process? Join Intel Cloud Infrastructure Group GM Jason Waxman and Forrester VP and Principle Analyst James Staten discuss the trends, key players, opportunities and how to specifically take advantage of an open cloud computing approach to address key challenges today. They will explore how to build upon IP that others are sharing, advances in open source cloud, open standards development, the Open Compute Project, and much more followed by a question and answer session! WWT's pragmatic approach toward IT Transformation that not only considers the technology involved but the people and processes that must be considered as well to enable your organization to continue to evolve toward cloud. Scott Miller, Director of Cloud and Virtualization, World Wide Technology, Inc.
One size doesn't fit all. Scott Miller helps organizations understand how to determine where they are today in cloud adoption and how far they should go to achieve the most beneficial attributes of a cloud for their organization. How can an organization migrate from 25 years of desktop and application management habits to the more optimized virtual environment available today? Scott Webb talks about why organizations should think about a broader vision of "VDI" that can encompass application, user, and desktop virtualization. The boundaries between work and life have blurred and users expect consistent access to corporate services from wherever they are, on any device and at any time. This is driving IT to look at new technologies to better support the business, users and their own organizations. The result is often a combination of multiple devices and a mix of delivery platforms, and it creates a growing challenge for IT to deliver and support a consistent and secure user experience. Join guest analyst Rachel Chalmers of The 451 Group in an interactive session led by Jeff Wettlaufer, RES Software Sr. Global Director of Product Marketing. They will discuss desktop trends faced by IT and solutions available to address these new demands and enable context aware hybrid desktops and automated service portfolios. Rachel will provide findings and recommendations based on the latest 451 research surrounding desktop virtualization technologies. * How IT can better navigate today's hybrid desktop environments by introducing centrally controlled and flexible workspaces to provide users consistency across devices and delivery platforms. * The importance of understanding context beyond user name and enabling their workspace to react to that context with dynamic services. * The benefits of simplified and centralized automation portfolios to help implement, administer and support new desktop technologies. * How workspace and automation management solutions can improve future OS migrations and infrastructure changes with minimal disruption to users. Founded 7 years ago as a regional event offering hands-on functioning demos and breakouts on virtualization technology, this event has expanded to be a national show featuring collaboration, wireless, mobility, security, datacenter and virtualization technologies. All with fully functioning, hands-on demos. Attend to learn why this free event should be on your list of to-do's for 2012. Join us to learn about Cisco’s CITEIS – Cisco IT Elastic Infrastructure Services – project. Find out firsthand how Cisco deployed an agile, cost effective, flexible and secure private cloud using Cisco Intelligent Automation, Cisco UCS, and VMware technologies. Gain insights from Cisco IT for the planning and development of your own private cloud. Despite investing heavily in their security defenses many organizations are still finding their systems regularly compromised. The problem these organizations face is they are focusing too much on the defensive controls at their network perimeter in the false belief that this makes it difficult for their systems to be compromised. However, time and time again we see that once the perimeter controls fail attackers have easy access to the organization's sensitive assets. This presentation will provide attendees with a practical guide on how to secure their corporate assets by implementing a multi-layered approach to security incorporating the key cornerstones of people, process and technology. With this multi-layered approach should one security layer fail the other layers can compensate and continue to secure key organizational assets. Today's threat landscape and attacks are constantly evolving and it is essential that organizations ensure their security controls evolve to counter these threats. The attendee will be shown how to take a risk based approach to develop multiple security layers to deal with the current threat landscape and how to ensure each layer can compensate for another should there be a compromise. Relying on one layer of security at the perimeter is no longer an option, developing adaptive security controls at various layers is essential to securing systems in today's environment. This session will look at the needs of customers for interoperable virtualization management standards. Virtualization which is an important cloud computing enabling technology, is driving customer requirements for management standards to improve their agility while reducing their TCO. The goal of virtualization management standards is to improve IT consumer agility and define a set of architectural semantics that unify the interoperable management of workloads and resources between enterprises of all sizes and cloud computing infrastructures. In conjunction with one of the nation's leading technical tradeshows, the Geek Day Virtualization Channel features compelling technology thought leadership on the industry's best-of-breed cloud and virtualization solutions providers.